My modus operandi toward Pitchfork is to listen to the many bands on the bill that I’ve never heard of on a streaming service such as MOG well in advance, so by the time the festival rolls around, I’ll have a pretty good idea of who I want to see. With the lineup announced and the festival several months away, I’ve already found one must see band. 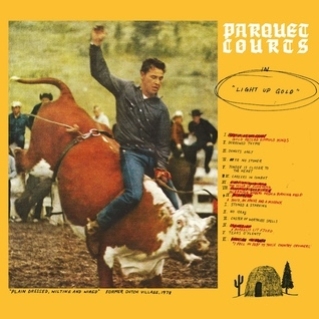 With 15 songs in just a little over 35 minutes, Parquet Courts create tightly wound jangly post punk song bursts that cover such topics as stonerism, joblessness, munchies, stonerism, girlfriends and even more munchies. Like Guided By Voices and They Might Be Giants before them, many of the songs on Light Up Gold clock in at just over a minute and are very well written and fully formed. On today’s Song Of The Day, vocalist Andrew Savage, who sounds like a cross between Stephen Malkmus (of Pavement) and Jonathan Richman (of The Modern Lovers), details the prospects for job security in this day and age, and quickly comes to the conclusion that the military is his only choice. 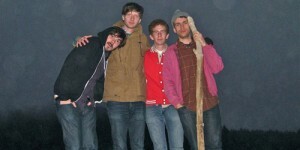 While the song is born of the punk esthetic, it manages to make its point on a bed of rolling drums in just 67 seconds. But Parquet Courts’ sound is not all short bursts of adrenalin either. The band also wears their sixties influences on their sleeve, particularly on the album’s centerpiece, “Stoned And Starving,” which clocks in at a little over five minutes and features a rambling guitar solo courtesy of Andrew Savage. Elsewhere, the pseudo-psychedelia of “Caster Of Worthless Spells” sounds like a long lost Mothers Of Invention outtake.